I think I have got what the objective of this ingredient round is in the MasterChef competition. The contestants aren't supposed to try and use all the ingredients presented: they are supposed to come up with the best dish they can from those ingredients, plus a few staples. Invariably. the contestants who try to use too many ingredients end up getting eliminated. In this round for instance, one girl made some kind of "sandwich" by putting some chopped up cabbage, peas, ground beef and something else between two huge grilled Portobello caps. It looked rather unappetizing, and apparently was rather unappetizing. 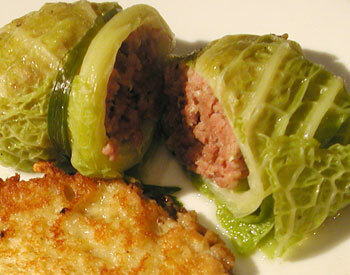 Anyway, when I saw ground beef and cabbage I immediately thought of stuffed cabbage rolls. 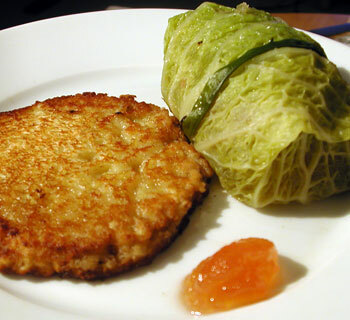 Believe it or not cabbage rolls are a staple of Japanese home cooking, but in this case I went Germanic and did a classic combination of cabbage rolls with potato pancakes. To add a bit of a twist to the filling, I added some chopped bacon and a bit of chopped mushroom. (I did get Portobellos, but since you are going to chop it up anyway, you can just use regular button mushrooms or any other mushroom.) This was ok, but I think the filling would have been just as good without the bacon. In order to minimize the well, cabbagey-ness of boiled cabbage, add a bit of something acidic to the cooking stock, such as a squeeze of lemon, some white wine, or a can of tomatoes. In this case I added lemon juice. I did serve the potato pancakes with a little quince jelly. You can also use apple sauce, which seems to be the usual accompaniment in German restaurants in the U.S., or just serve them plain. Unused ingredients were the peas and the blue cheese. Separate and wash the cabbage leaves, and blanch them. Chop up the filling ingredients and mix. Take out the cabbage leaves and let cool a bit, and throw in the flavoring ingredients. Fill and roll the cabbage. If the stem part of the cabbage leaves is too thick, shave off a little of it to make the overall thickness more even. Bring some water to a boil. Put in the cabbage leaves and cook for 3-4 minutes until limp. Take out and keep the cooking liquid warm. Cut the green part of the green onion lengthwise into thin strips. Take about 1/3rd of the onion and the celery stalk, slice roughly and throw into the pot with the stock cube and about 1 tsp. of dried thyme. Chop the remaining onion, bacon and mushrooms very finely. Turn the bread slices into crumbs. (Needless to say, this part goes much faster with a food processor.) Mix all together with the ground beef, season lightly with salt and pepper and about 1/2 tsp. of dried thyme. Divide the mixture into 8. Squish each portion into a rough oval ball and place on a cabbage leaf, near the stem end. Roll up, fold in the sides, and roll closed. (The key is to not overfill the cabbage leaves, so if you have small leaves, just blanch more of them and make smaller rolls.) Secure the roll by tying around a green onion strap. Add the juice of 1/2 a lemon. Carefully put the cabbage rolls into the liquid. Heat until the liquid is bubbling, then lower to a simmer and cook for at least 20 minutes, preferably longer. Beat the egg whites until soft peaks form when you pick up the beaters. Peel and finely grate the potatoes. Add the flour, egg yolks, milk and salt to the grated potato and mix well. Mix in about 1/2 of the egg white, then carefully fold in the rest so that you end up with a light and foamy looking batter. Heat up some butter or oil in a large pan, or on a griddle. Put about 1/4 cup portions (I just use a ladle which has an approximately 1/4 cup capacity) onto the hot pan or griddle. Cook until golden brown, and flip; cook on the other side. To serve, place a pancake or two on a plate, with a teaspoon of quince jelly or other not-too-sweet, slightly bitter jelly. (Marmalade may work even.) Take out a cabbage roll with a slotted spoon. Note: another less fiddly way of securing the cabbage rolls closed is to use 1 or 2 pieces of spaghetti to skewer them. People often use toothpicks for this but I always forget to take 1-2 out, and it's not nice to end up with a mouthful of splinters. The spaghetti just gets cooked - no splinters! Submitted by maki on 2006-02-05 07:34. That looks like a tasty meal. My mom used to make cabbage rolls when I was a kid (she called them "roll cabbage")-- I disliked the soggy cabbage then, so I used to just eat the ground beef inside. Your cabbage still has a vibrant green, and looks more appetizing than the ones I remember from my childhood. Yep my mom called them 'roll cabbage' too. I didn't like the cabbage either...until she started to use tomato in the soup part, then the soup part and the cabbage became very yummy! I think the cabbage here is green because Savoy cabbage is very green and fresh-looking. This looks very yummy, and it should be good. It could be quite filling. yoko and maki: the savoy cabbage is said to be greener in winter, and paler in the summer.